Kenan’s background as a formally trained artist contributes to her eye for detail, composition, and color in all that she does. Photography and painting are her main media, but that training extends to many things, including plating dishes of food and arranging flowers. Kenan is co-founder and Curator of Flowers for Chivalry Flowers (formerly Real Men Buy Flowers). Her previous work includes creating menus and product management for meal kit delivery company Peachdish, teaching cooking classes and photography workshops, producing product and lifestyle photography, and painting custom pet portraits. Kenan holds a bachelor's degree in studio art with a concentration in painting from UNC Chapel Hill, as well as a business certificate from UNC’s Kenan-Flagler Business School. Kenan and her husband Nick live in the Morningside neighborhood of Atlanta, Georgia. Shantel: Hey, Kenan. Welcome to the podcast. Kenan: Hey, thanks for having me. Shantel: Yeah, we're excited to have you on. I know we've had an opportunity to chat offline over the last few years, but I'm excited for our listeners to get to know you a little bit better. Can you share what's currently keeping you busy, a little bit about that to start? Kenan: Yes, lots of things, of course. The biggest one is an online flower delivery startup that I'm one of a few co-founders, and we just launched in August so we are just in that really raw time of figuring out what resonates with customers, what's working, what's not and about to do our first pivot, which is a name change. Up until now, it has been Real Men Buy Flowers. Starting this week or so, it will be Chivalry Flowers, which we can talk more about. Shantel: Yeah. Okay. Let's rewind a little bit more. How did the flower space and this opportunity come about? We can dive more into the business. Kenan: Sure. To go all the way back, the indirect way to this company was about a little over five years ago, I was on the golf course, which is not something that I think you hear many women say, and playing golf with a friend who said, "Hey, Kenan. I have a friend who has this food startup. You know a lot about food. You'd be great. You all should get together." A week later, I was the second employee at PeachDish, which is where you and I met as one of your first social media clients. I was there for a little bit. This past spring, Hadi, who is the founder of PeachDish, who I've stayed in contact with, reached out to me about this flower company that he was a part of. I was initially consulting with them, and then they asked me to come on as one of the co-founders to really head up the flower design, which was part of what I did already but something I've always been really interested in. Having a background in art has certainly helped inform that. It's all composition, whether it's 3D with flowers or on a canvas painting or photography, all of which I've done. Yeah, that's the roundabout way I got there, but really just connected with Gillian, the CEO, we're really the same page about a lot of things. It's a fun concept to be marketed for men and really trying to make flower buying easier. As a married woman, I would love to receive more flowers, so I figured nothing better than to get rid of a few of the excuses that my husband has from time to time. Shantel: Nice. I guess taking it back again on the golf course, were you at that time doing freelance work, consulting, painting, photography, taking a break in between things? Kenan: Yeah, I was in between things. I have been doing ... I got an art degree in college after studying science. I did a total 180 in college and was doing, painting custom pet portraits, which was really interesting, but the people that commissioned pet portraits are not the easiest people to work with. I decided to lean into doing really trying to do art on my own and try to get into galleries. I was about to do that and then this opportunity came up, and what started as a part-time gig became very full-time. I really leaned into the food world and the startup world and all of that. Shantel: That definitely sounds like a startup evolution of part-time to full-time. There's no time to breathe. We are all in. Shantel: I'm eager to hear more about this pivot. It started in August, a couple of months in. A name change is really big, so let's talk about that. Kenan: Yeah. It's something we've been thinking about. The name was already in place when I came on board, but we initially knew that it might be a little bit controversial, and we were really trying to be for men and in a way redefine what a real man is as being sensitive and thoughtful and all of that. What we've realized very quickly is that it has become a very political conversation and there's been so much energy focused on, well, what is a real man? Are you saying this kind of person isn't a real man or this person? What we thought could be good in sparking conversation has really dominated, and we decided we don't want to be here to have a conversation about what a real man is. We're trying to sell flowers. It's also been perceived as perhaps sexist or homophobic, and we're all coming from personal value systems of being very inclusive and so we wanted to make sure that our company represented that as well, and especially with #MeToo and all that's going on politically in the world. We needed to be a little bit more explicit about really being for all men regardless of to whom they're sending flowers. Shantel: How interesting that ... What a cool ... I guess a quick lesson that you guys had to just come to terms with and shift and shift quickly, and it's a shame that that had to come to that. I applaud you guys for recognizing something and knowing the direction that you guys need to go in. Once you decided to do something now that you have branding and packaging, has that had to change and how are you feeling? Kenan: We were as a team all together last week in LA for a photo shoot and video shoot. The first day we landed at the airport, we got together and we're all like, "Okay, how do we feel about names and new names?" We all really just agreed on Chivalry Flowers and bringing this concept of chivalry to the 21st century. I think we all feel good about that. We had already adopted the knight as our mascot, sort of. We decided to just really take that and run with it. We actually bought a knight costume, like full metal costume that a couple of poor actors had to parade around Southern California in last week. That I think has been an easier transition. I think to be honest, we hadn't totally found our voice prior to this. Whether it was social media or our copy, we knew what we wanted it to be, and I think that the real man line was complicating that. I think it'll be a little bit easier. We are really close to it, but now we can use more of the chivalry language and the knight and all of that. I think it's really helped inform our very slightly new direction. I think it's good. We have a really amazing designer that did our logo and some of our branding early on, and they are working on the new stuff. I think we'll be able to keep a lot of the fonts and the nitty-gritty stuff. We are also building out a new website right now, which was happening prior to the name change anyway as we realized building out a subscription platform in e-commerce is a lot more complicated when it's not just a monthly like you get flowers sent the first of every month. Our concept was that someone could sign up for a birthday, anniversary, Valentine's, Mother's Day, just because, and that is not on regular intervals. Just in building out this very custom website, it got really complicated, and so we made the difficult decision to start over from scratch. That is also about to go live, which has helped us hurry up and make the name change so we can do it all at once. We feel good about it. It's a little bit of nervous anticipation. I think, in having a company that's really geared toward men, I think we're still going to have complaints about it being sexist or misogynistic, which I don't think it is at all. That is what it is. Shantel: Well, it sounds ... You've been a part of other startups. You've started other companies. You're now in this. Do you feel like your experience from these other moments in your life have really helped create some balance and structure and process for everything that's changed in the last few months for Chivalry Flowers? Kenan: Absolutely. I wouldn't have necessarily thought so, but all of the experience at PeachDish was super relatable to this. It's perishable goods. I worked on the boxing design. I helped with the branding. I did a lot there that has overlap. That has come in handy. I knew a lot about cardboard fluting and other things that I had never thought I would that I've been able to draw on again. Just having done a lot of my own ventures, I haven't had a linear journey, so there have been lots of twists and turns. I think having almost a decade of that in my back pocket has made it easier to be nimble and a little less scary. Shantel: Can we touch a little bit on how you guys have it set up? You mentioned you're one of four co-founders. Do you all bring different strengths to the table? You mentioned Gillian and Hadi. You met Hadi ... You heard of this company through him, and you had never met the other two co-founders before this? Kenan: Correct. Hadi and Gillian connected through EO in Atlanta in entrepreneurs network, which you know. Her background, she's been the COO of a couple of companies and done consulting work and really knows business. I feel really good with her in the helm and steering things. Tony is our other partner. He is out in LA. He is a longtime friend of Gillian. He is a film director, so he has really helped with a lot of the creative direction, and he's totally our target market. He has really owned the voice of our company and has also produced some really amazing videos for our company that we never could have afforded had we had to pay his full rate. Hadi was shipping and web stuff, building out PeachDish and a number of his other ventures. He knew a lot about that and has been great in connecting us with getting good shipping rates and figuring out SEO and stuff like that. Shantel: That's great. Do you just have very clear boundaries of, okay, I own this particular segment? Has there been any overlap so far that's caused any tension? You're all in with people that you haven't really met. How did you guys find a way to establish that immediate trust? Kenan: Like I said, Gillian and I really hit it off and I think felt like we were on the same page, so that helped. We're connected through other people and had overlapping connections, so that certainly ... It's not like a cold call. I really get to own the flower domain and that at the end of the day is really me, the design. With Tony and I both being the creative space, we overlap some. We don't always see eye to eye on everything, which is fine, and I think having that, what is sometimes tension can be really healthy and us hammering out what is our brand voice or what is our aesthetic? We are coming from very different backgrounds, his in film and mine more in still photography and fine art. He's a guy and living his best bachelor life in Venice Beach, which is very different than my very tame life in Atlanta. Gillian and I also have some overlap and just figuring out the recipes. We call them our bouquets. I realize this is a weird term to other people when they hear it. We call them recipes because it's literally we put five roses in this and 10 stems of Ruscus and whatever. That's what we send the folks who do our fulfillment. She lets me own that, but then we're coordinating to make sure that they're hitting margins and going to work well with being shipped and that they're high end and look really lux. We're all sorting it out a little bit at a time. There are definitely overlaps, and there are definitely things we all get to own. In the half a year or a little more that I've been working with them, we're learning to shake it out. Shantel: I appreciate you sharing that and diving into how that structure is and just some vulnerability with that. We just as a leadership team read the book, The Five Dysfunctions of a Team. Have you read that book? It's a really good one. One thing that really resonated in the book, and they use the analogy, what makes a movie successful in entertaining and one that you want to go back for and there's always conflict. No matter what, every movie or show has some sort of conflict. They brought it back to how every business in order to actually move the needle and continue growing, there has to be conflict, and it's never personal, but there has to be some healthy debate and conversations and heated conversations. Otherwise, you're just all operating in your own lane and it's boring. Anyway, it just aligned with what you just mentioned in that. We're starting to try to infuse more conflict in our own company just because it resonated with us as a team of if we're not, not even arguing but if we're not debating ever anything, then is there ever any passion in anything we're doing? Kenan: I think something we've done well as a team is have the lines of communication open where we ... At least, I know I feel comfortable expressing an opinion that's different than what they're saying. I just have to have the humility to understand that sometimes that what I want won't be what is right for the company or I could be overruled by the rest of the team and that's okay. I appreciate that we have a company culture that allows for that conflict. Shantel: That was also something that they touched on of just allowing everyone to have a voice and to be heard and that's enough for people, even if what they hoped would happen didn't actually pan out. The decision may have been completely different, but as long as everyone was heard and understood where the decision was heading. Anyway, sorry, I keep tying it to that book. I think it was just really fascinating to think through things. Shantel: Are you traveling quite a bit to LA to help with that piece or have you been able to outsource or hire some teammates there to help? Kenan: Tony is out in LA, which is great to have him out there. Our fulfillment is out of Southern California. It's in Oceanside, and it's a company that was actually already shipping flowers for some of our competitors. It's not a conflict of interest. They just already had the infrastructure there, which was really great because most flower wholesalers would have no interest in taking on a little startup at our volume. They were really great and really excited about this new wave of online florists. They already had a team in place. They have their system of packing the boxes and whatever. I went out on our launch week in August and got to meet the whole team. That has really helped with communication, and we really trust them to do what we need them to do, which is really awesome. I've been out a couple times, but we've been able to really do most of it over phone and email. Shantel: That's great. Let is just shift gears a little bit into finding customers. It's a new product/service to the market. How have you guys been able to attract new customers? Shantel: Yeah, ground floor gorilla marketing. I like it. When you and I originally saw the website, there were different options for each type of event so birthday or anniversary. When you talk about making it even more simplistic, are you taking away some of the variety in which they can order or just the process? Kenan: We only have eight occasions, so there's birthday flowers, and it's one type of bouquet, and there are three price points. That's it. We've kept that. I just said we were stripping things away. We actually are adding another tab where you can just order to buy flowers, so if you say I really want red roses, you can go in and get those. We just added these really beautiful orchids, so that will be an option to just buy that. It's really the process that you lose people if you have to click through too many screens or if it's too confusing of when you're sending these flowers and what size. Just streamlining the user flow. UX has been a huge focus for us. Shantel: Yeah, I can imagine some of that analysis paralysis of too many options or too many tabs or too many click-throughs. It's like I've just got to get this done and crossed off the list. Let's talk a little bit about your day-to-day so working away from there, LA. How are you optimizing your day-to-day work? Kenan: It's a little bit different. 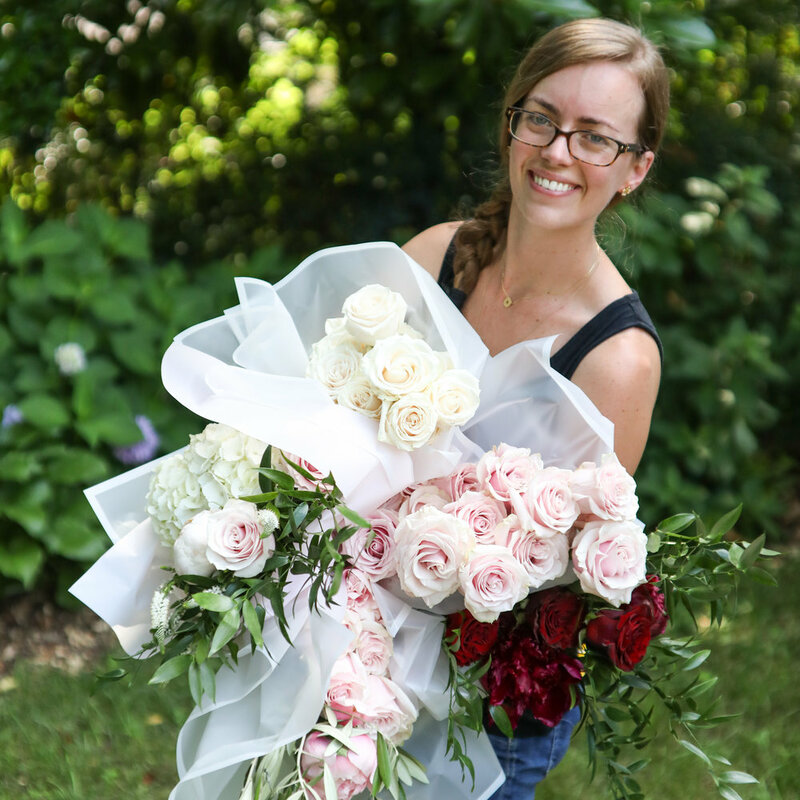 For me, day to day, I every month or two will be working on new rounds of recipes for bouquets because we want to really keep things fresh and seasonal. Sometimes we literally can't get certain varieties of flowers or we get priced out depending on where they're being grown. That's something that will be somewhat regular but isn't every day. That means I'm going to wholesalers here in Atlanta to look and see what they have and get inspiration. I'm looking at lots of Pinterest boards of flowers and bouquets and color combinations and all of that, and of course doing research on our competitors. That's a little bit of it. With us being a really small team right now, there are all sorts of things that pop up day-to-day of here's a draft of ads. Will you just give these a run-through or looking through the website and making sure that we've changed our name in all of the places. I do some of the photography as well. Sometimes that ... The answer is that it's not the same every day. I think that the rest of my schedule is fairly flexible, but the team is pretty good. Yesterday, I had a photo shoot for a different client all day. I just try to knock out timely things before that, and they're pretty understanding about saving things for after, and I think that's been true for Tony too when he has film projects. Yeah, it's a lot of communication, is what it is, a lot of group texts and calls. Shantel: Nice. I appreciate you leveling and I'm sure everyone can kind of relate to this. It's so different every day. It keeps things interesting for sure. Well, how can people learn more about your business and contact you if they're interested in chatting further and buy flowers? Kenan: It's a little more complicated answer than it would have been. We are currently at realmenbuyflowers.com, soon to be chivalryflowers.com. My personal Instagram, which is a place that I live a lot is Kenan Hill, just @KenanHill with one E. My email is kenan@realmenbuyflowers.com, which I assume will soon be kenan@chivalryflowers.com. Shantel: Great. Well, we will definitely hyperlink everything in the show notes, but we appreciate you carving out the time to connect and share all about your entrepreneurial journey. Kenan: Yes. Thanks for having me.